Strixchase.com is a search provider usually classified as a browser hijacker for its ability to change browsers’ settings without permission. You should know that your PC has been infected with this threat too if you see Strixchase.com opening automatically each time you open your web browser. This infection can only affect Internet Explorer, Google Chrome, and Mozilla Firefox, so if you use another browser, you will not see it even if a browser hijacker infection promoting this search tool successfully enters your computer. In any event, malware must be removed from the system. As you will see for yourself if you read the next paragraph of this article, it might be dangerous to use Strixchase.com as a default search provider even though it looks like a trustworthy search tool. Because of this, we cannot allow you to keep it no matter how it has shown up on your PC. Go to remove Strixchase.com right after reading this article – it should be easier to do this when you find more about the removal procedure. Strixchase.com pretends to be a trustworthy search provider, but the truth is that it is not as decent as it might seem to be at first glance, malware researchers have revealed. It will provide you with search results, but they will be full of advertisements. Because of this, it might be dangerous to use Strixchase.com for searching the information on the web. The reason we suggest going to implement the Strixchase.com removal as soon as possible is the fact that these advertisements it displays might redirect straight to pages with a ton of malware. You will not know about that until you discover malicious software installed on your system. Frankly speaking, it might be enough to make one wrong click to allow untrustworthy software to enter the system, so the sooner you uninstall Strixchase.com from your browsers, the better. How did Strixchase.com enter my computer? No matter it is your fault that Strixchase.com has become your new homepage and default search tool or the browser hijacker has entered your system illegally, you still need to remove Strixchase.com from all your web browsers as soon as possible because it will not do anything good and you might even end up with serious malware if you let Strixchase.com stay. This browser hijacker is not the only infection that can apply the undesirable changes to your browsers. In fact, such infections are developed frequently by cyber criminals, so we have a single recommendation for you – install security software. How do I delete Strixchase.com? You cannot allow Strixchase.com to stay because it is not a legitimate search tool. 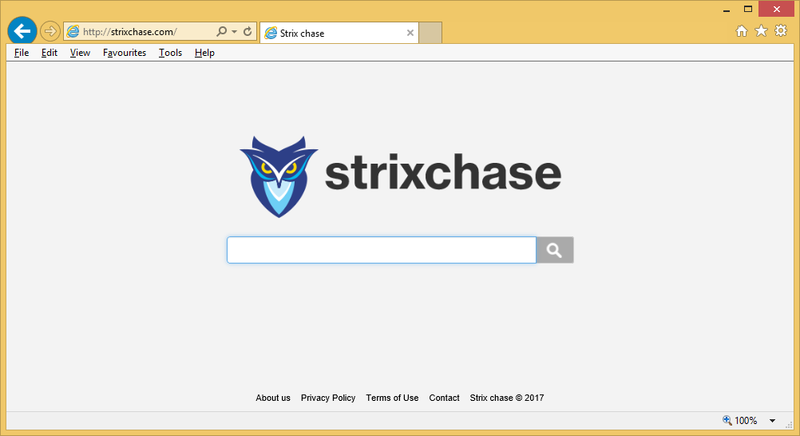 It might show search results that might expose users to threats, so you should go to delete Strixchase.com as soon as possible and then start using a new search tool instead of it to prevent this from happening. Browsers can be cleared either manually or automatically; however, if you do not have much knowledge about computers and the removal of browser hijackers, you should use an automatic tool to remove the undesirable website from your browsers.